Home prices seem to be continuing to decline throughout most parts of the country. The First Time Home Buyers Tax Credit has been extended, and expanded, to allow current homeowners a $6500 credit if they have lived in their current home at least 5 years. It sounds like a great time to purchase an old house, and it is. knowing exactly what you are getting in to. New homes go through local jurisdiction inspections prior to receiving an occupancy permit, and even then, some items are missed depending on how thorough the inspectors were. Old houses are a completely different animal. Many were built before inspections were conducted by trained professionals, and during the old house’s lifetime, many changes may have been made that can cause structural damage or safety issues. Prior to committing to purchase, it is always best to have a home inspector check the house out–an inspector who is familiar with old houses and their construction. From a financial standpoint, this makes sense because that old house you’ve fallen in love with may require an immediate input of cash that wipes out your tax credit savings, and beyond. 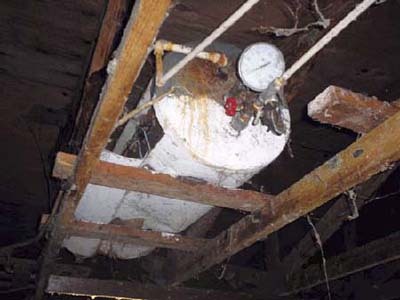 But more important, it is a good idea to get a home inspection to ensure your family’s safety. You may think you know enough about construction to inspect the old house yourself, or maybe you have a friend who claims to be a construction expert. However, don’t take a potentially expensive or dangerous chance. I have been around home building for the last 25 years, and have lived in old houses since 1967. If I was thinking of purchasing an old house, I would hire a professional old house inspector. Sometimes a second set of eyes sees things the first set of eyes misses, and a professional old house inspector looks at items objectively, rather than with eyes that have fallen in love with the whole house and don’t see the potentially dangerous or expensive issues. By all means, purchase that old house and make it your home. It will have character and personality that a new home might never achieve. Just make sure you take your time, get the old house inspected, and go into the purchase knowing exactly what you are getting.